THE Amadeus-funded school in Senegal is well underway following a recent ground-breaking ceremony organised in partnership with Dubai Cares, part of Mohammed bin Rashid Al Maktoum Global Initiatives. 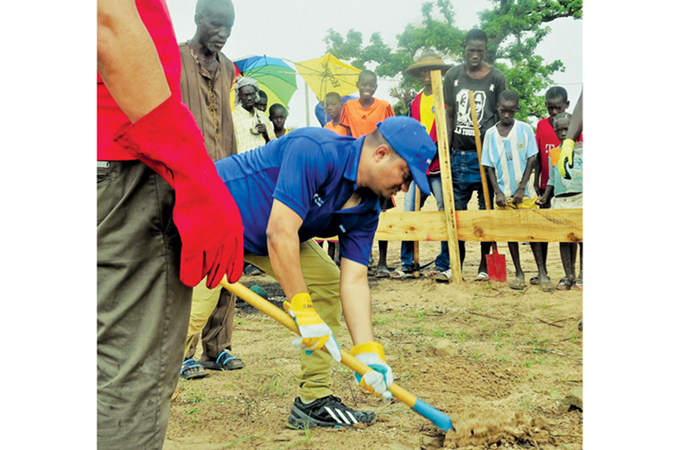 Marking Amadeus Gulf’s 30th anniversary, four representatives from Amadeus Gulf along with other UAE-based volunteers travelled to Ngol Ngol village in Senegal to set the foundation of a new school adopted by Amadeus under the umbrella of Dubai Cares’ Adopt a School initiative. The volunteers joined members of the local community in activities that included digging, lifting, pumping water, mixing concrete, reinforcing steel bars, among others. Upon completion, the community-based primary school will benefit 60 school children, 60 illiterate adults and 300 villagers. Senegal has a low literacy rate of about 39 per cent and low enrolment rates in primary and secondary schools. More than half the people in Senegal live below the poverty line, and many children face difficulties in attending school due to lack of opportunity, or the distance to the closest school is too long. The rural areas in Senegal are one of the most economically challenged and underserved regions in the country and is in need of major educational investment.